The ugly hand of unbridled power has once again been unleashed by another dictatorial, tyrannical, oligarchic Grand Lodge. This time it is New Jersey. And the recipient, six time Past Master Mike McCabe, is not taking it lying down. McCabe found that an unauthorized member of his Lodge was writing checks to the tune of $10,000 and not turning over $7,000 in receivables to the Lodge Secretary, but instead was depositing those funds into a Lodge checking account neither the Lodge Secretary or Treasurer knew existed. When he called this to the attention of his District Deputy he was told that if he had proof that this had taken place he needed to file formal charges against the Brother(s) involved at a Communication of his Lodge. McCabe thought this peculiar because while he, like many other Brothers in this situation, might have a snippet of information only the Grand Lodge could investigate books and records fully to make a complete case and that needed to be done first before any charges were filed. McCabe’s District Deputy told him not to bring up the subject again unless he was willing to file charges. Both before and since this particular episode occurred, Lodge Secretaries and Treasurers have been suspended by Grand Lodge, for allegedly failing to provide their installed successors with a Lodge’s books and records. McCabe persisted because Grand Lodge’s in-actions in this instance was even more puzzling since Lodge funds had been expended without the knowledge or consent of the Lodge’s elected fiduciary officers. The existence of this Lodge checking account had been withheld from them. He had disobeyed the orders of his Worshipful Master to produce documents backing up his allegations. He disobeyed the direct order of his District Deputy not to bring the subject up anymore but to file charges himself. Possession and control of stolen property – stolen aprons. Charge #3 was a made up bunch of malarkey thrown in to make the situation look worse than it was. This charge was based on hearsay because the individuals who made the accusations concerning the theft of Lodge property were not the individuals who preferred and signed the charges against him. Grand Lodge rules require the person making the allegation must sign the charges. The individuals that signed this charge refused to testify, admitting that they had not been present when the alleged offense supposedly occurred. Instead two other Lodge members testified in support of the allegation, one of these being the Deputy Grand Master. McCabe was found not guilty and exonerated on this charge but he was found guilty on the other two charges and expelled. McCabe claims that 20 or more violations of Section 13, Charges and Codes for Trial, occurred at his trial as well as numerous other violations of the New Jersey Constitution. 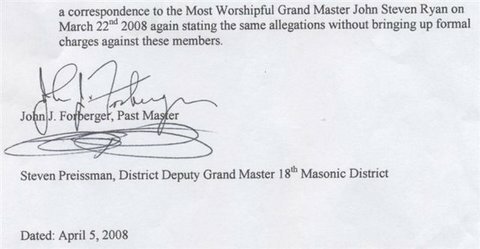 In regards to charge #2 – “District Deputy Grand Masters have no authority to ……decide questions of Masonic Law” (Section 16-02). The power to decide all questions related to Masonic Law (or serious Masonic issues), rests solely within a Grand Master’s purview. McCabe could not find another Mason to represent him so he represented himself and as the saying goes had a fool for a client. It seems hypocritical that McCabe’s Grand Lodge was persecuting him for allegedly ignoring two bogus charges made against him, but turned a blind eye to the numerous violations of the Constitution permitted during his trial process. Moreover a Mason brought up on charges to a Masonic trial is supposed to be tried on unmasonic conduct or a Masonic offense. According the Grand Lodge Constitution expulsion is reserved for individuals who have been found guilty in a civil court of law for committing 1st or 2nd degree criminal activities, or at a Lodge’s discretion, 3rd or 4th degree criminal offenses. What McCabe was charged with was trivial and does not meet this criterion. 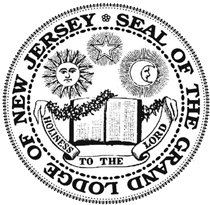 Since when is notifying the New Jersey Grand Lodge of potential violations of its rules and regulations a criminal offense? Expulsion is not a punishment that fit the crime in this case. Lastly McCabe alleges that the charges are unconstitutional and that a Grand Master willfully and knowingly violated his own Grand Constitution. The accuser that alleged that McCabe was in the possession of stolen property did not sign the charges as required. The Constitution requires that the members of a Lodge shall be summoned to meet at a regular Communication, for determining the degree of punishment to be afflicted on the accused. That summons was required to be signed by both the Worshipful Master and Secretary of the Lodge, and embossed with the Lodge’s seal. None of this was done. These and many other irregularities too numerous to mention constitute what McCabe alleges as a violation of his civil rights. A legal opinion regarding civil rights violations from private and semi-public organizations has been offered by the US Supreme Court and was used in a decision between New Jersey homeowners and their Homeowner’s Association board. The article on this court case also highlighted some important practical applications of the rights of those involved. It must be remembered that Grand Lodges who have incorporated and become a nonprofit corporation are no longer an “untouchable”, solely private entity. They must abide by the rules of incorporation of that state and obey all civil law regarding the regulation of said corporations. Such civil regulation of Grand Lodge takes precedence over and supersedes Masonic tradition and the by-laws, rules and regulations that Grand Lodges have written in their own private Constitutions. Grand Lodges are not exempt from Civil rights law that has been codified by civil governments. Because they are now a semi-private, semi-public corporation, Grand Lodges have brought themselves into the civil sphere and must adhere to civil constitutional guarantees that are required of corporations. As such, when a Grand Lodge violates the rights of an individual member and does not follow its own published rules in its Constitution and refuses to follow civil rights as has been specified by civil law in regards to corporations, then an aggrieved member such as Mike McCabe has a legal case with Constitutional issues that buttress his claim that his civil rights were violated. And right now all Mike McCabe is asking for is an appeal so that he can be heard again, with competent counsel to put forth his arguments based on the additional research he has accomplished. As of this moment McCabe has shown no inclination to take his case into the civil courts. 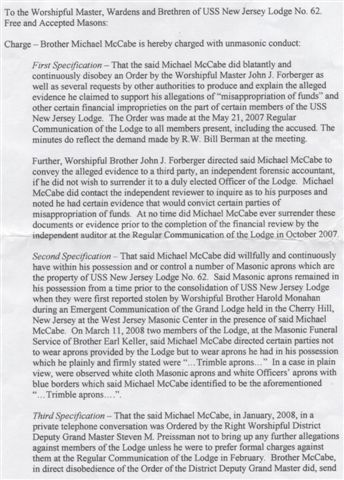 The Grand Lodge of New jersey would be wise to grant Mike McCabe an appeal and another hearing. It is also very non Masonic to expel a brother on trump up charges. We need to be very fair in our dealing with our own, in order not lose any Freemason. And to also continue to attract good brothers into Freemasonry. It’s hard to comprehend the amount of corruption that would need to exist at the highest levels in order for this whole article to be true. I hope it is not but if it is then an immediate change at the top is needed albeit warranted. The king will never rule against the king. If there is no one more powerful than the king then real and meaningful change is just an illusion. If this is true it is also disgusting because it happened within an organization that prides itself in fairness and equality. I hope these issues get resolved quickly and honestly. #1 – The stolen aprons were a ruse just thrown in to make it look like a legal trial on something worthy. McCabe had proof that the aprons were not stolen and the charge was speedily dismissed. #2 – If you think it is hard to comprehend this amount of corruption – wait until you read Part 2. The really amazing facts of this case involve the Deputy GM that testified against McCabe. The party that McCabe questioned was the DGM’s good friend and Secretary to the GM (once he acheived that position). Ratter than recusing himself from the case, the DGM instead injected himself deep into the matter. After he became GM, he injected himself deeper into the case. He approved a penalty phase for the accused at a “regular meeting by dispensation” in July. The Lodge in question like most NJ Lodges did not normally meet in July and its By-laws only provided for meetings in September – June. Neither the Lodge itself nor the NJ Grand Lodge Constitution provided for such a provision. Does anyone else smell the odor of conflict and retribution emenating from this case? The corruption is indeed stronger and deeper than one may believe to be possible. As a very young freemason I was present at a majority of the meetings and 4/5 of the votes to consolidate lodges; which were voted down. The origin of all of these cases such as the one against a WORTHY PAST MASTER MCCABE is far more astounding than anyone may ever hear about. Imagine a master of a lodge sitting handsomely on funds Grand Lodges either wants or needs and offering that residing master his time as Grand Master if only he cooperates now and follows through the chairs accordingly in the same year his professional career ends in retirement from Verizon. Sounds almost like an offer too good to be true — idle hands…and so forth. Today we look back at the unthinkable at 9-11-01 just think at what can happen? I have known WB Mike McCabe for 15years I served with him when he was Master of Trimble Lodge 117 F & A. M. He served with me when I was Master of Trimble Lodge 117 F & A.M. As a Past Master I will stand by his side today as I have in the PAST! I would like to bring to everyone’s attention the problem that I ran into a couple of years ago in the state of Massachusetts. I was raised to the sublime degree of a master mason in my fathers lodge in the mid 1970’s. About a year later I joined the military and 18 months after I was raised I entered the armed forces of the United States. I kept my dues up to date and I visited this lodge several times in the years that followed. I am now retired from the Armed Forces and a couple of years ago I moved back to the area and started attending this lodge that I had been a member of for about 30 years. When I started attending this lodge, the sitting district deputy grand master. Who was also a past master of this lodge started making several different comments to me in regards to me attending my home lodge again after all of these years of being absent from attending this lodge on a regular basis. This district deputy grand master went as far as to threaten me not to attend this lodge and also the other lodges in the district. In this district there were several things that were also going on in the district that was actions that were unbecoming of a master mason. I brought this to the district deputy grand master attention and was told by him to keep my mouth shut about these actions that were taking place in the district. At this point in time, i made known to the grand secretary about these actions and all of the facts pertaining to the actions of unbecoming of a master mason. Basically the sitting grand secretary told me that i was a lair and also I did not know what I was talking about. I was in attendance in my home masonic lodge. This sitting district deputy grand master threatened me in the men’s room to the point of showing me an item that he had on his possession. He threatened me with great harm with this item. He told me that there was going to be a meeting set up with me and a couple of these brother master masons in the grand secretary’s office the following friday morning. I would be getting a letter from the grand secretary informing me of this meeting. He further informed to me that if i had any intentions of going to this meeting he would make sure that i did not get to this meeting. This up right and just master mason, and also the sitting district deputy grand master from my masonic district threatened me past the point of no return. He also made references of his being a soldier in Vietnam and some of his experiences that he was involved in during his tour in Vietnam. I did receive this letter from the grand secretary informing me of this meeting a couple of days later after this conversation with this up right and just brother master mason. I did inform the grand secretary of my conversation with this sitting distract deputy grand master from my masonic district after receiving this letter. Again the grand secretary told me that i was a liar and I was imagining these things. I felt that this up right and just master mason would go through with these threats that he told me in my masonic lodge bathroom days before. I did not attend this meeting, and I received a letter from the sitting grand master of my actions. He said in this letter that my actions were unbecoming of a master mason and that I was banned from masonry for the rest of my life. I have since joined another grand lodge jurisdiction, in joining this new grand lodge jurisdiction the sitting grand master could not give any facts to the new grand lodge jurisdiction. The only thing that he could say was my actions were unbecoming of a master mason and there fore I was banned from this grand lodge jurisdiction. I have had numerous conversations with members of this masonic lodge and the masonic lodges in the district telling me that the grand lodge of massachusetts made an example out of me. They have further said that the younger generation was taking over and the older members were not welcome in the masonic district any more. The younger generation wanted to make a point. The point being you are not welcome anymore if you over the age of 35 to 40 years old. Since I wanted to enjoy masonry and it’s teachings. I had to go to another grand lodge jurisdiction. The latter part of Bro. Thomas’ story is true to form. In a time when numbers are down both in the fraternity’s involved members and financially, some members look to make their footprint on the history of their local lodge or leave some legacy elsewhere in masonry. Instead of doing the most dutiful of things and simply serving the craft in the most pure form possible, they begin to cause drama and chaos. We have known this and seen it demonstrated throughout the country. It’s ludicrous and sad. May God have mercy on their souls. I am a Past Master of a Lodge under the jurisdiction of the Grand Lodge of Massachusetts. The members of Trimble Lodge 117 F&AM permitted me to raise my son to the Sublime Degree of Master Mason at that Lodge even though I am not a member of Trimble Lodge. It is my honor to have met Wor. Bro. Mike McCabe. He is an honorable person and I firmly believe that he was dealt a wrong by the Grand Lodge of New Jersey. It is my sincere hope that the Grand Lodge of New Jersey officers come to their senses and restitute all of Wor. Bro. McCabe’s masonic rights. May the Grand Architect of the Universe instill upon the New Jersey Grand Lodge officers the wisdom, brotherly love, and sense of rightness necessary to right the wrong that was inflicted upon Wor. Bro. Mike McCabe. Mike McCabe passed away today on March 13,2018 he was one of my best friends for over 30 years. In our early friendship he took me up to the Grand Lodge in North Jersey for a ceremony – he wanted me to consider joining the Masonic Lodge. I never did join but I always knew that Mike was of the highest standard that a Mason could be, he lived and breathed the Masonic traditions and embraced them. When he saw wrong with this lodge that had shady dealings going on, he reported it. That’s the way Mike was, an honorable man who had character beyond belief. He held himself to a high standard and expected that of others in the Masonic Brotherhood. To be thrown out of the Masonic Lodge was something I never expected that other Masons could get away with. They may have done this to him but I believe the bad karma will eventually come back on them- the cowardice and malice they showed Mike is yet an example that evil and corruption exists in the least expected places. No, the Lodge never voted Mike McCabe back in, but he will always be a good standing Mason and person in my eyes and in the eyes of many who knew him. God bless, Mike, Rest in Peace my brother.